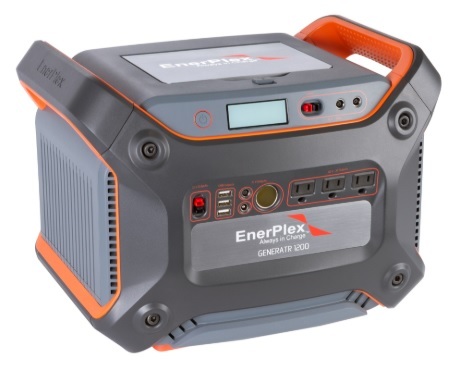 Top 3 portable solar generators suitable for powering power tools are presented in the article. This article will present and review the top 3 solar generators used for power tools and help you make your decision easily. Solar generators are widely used to power almost anything: your phone, TV, laptop, lighting etc. So, why not use them for power tools too! They are the ideal solution for any off grid job that you are required to do. And if you think they do not have enough power, you will be very wrong. You just need to choose the proper solar generator and your power tool will work efficiently without any interruption. Before making any purchase, check the wattage you will need for your power tools. The typical hand held power tool runs from 300 to 1200 watts and the larger tools run up to 2000 watts. Also have in mind the starting and the running wattage (also referred to as occasional power need and continuous power need). The starting wattage is higher and is only used once, while the running wattage is much lower. If you are not using multiple tools at once, you can get a small solar generator and have no problems. Here are the top 3 solar generators most suitable for power tools. Chose yours in accordance to the tools you will be using and the power you will need. 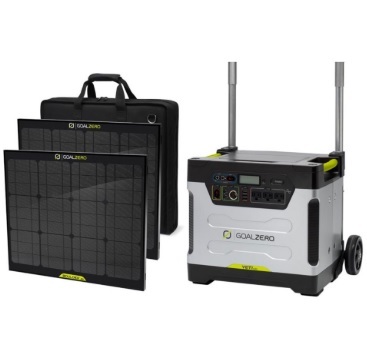 This solar generator has a quiet operation at 400Wh and a 33Ah (12V) battery capacity. Continuous watts: 300; Starting watts: 600 surge pure-sine wave inverter. Powering options: two USB ports, two AC outlets and 12V output. 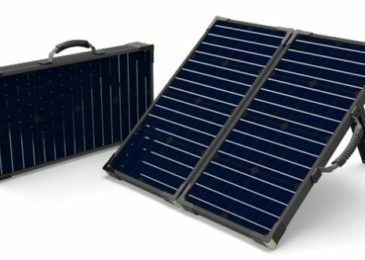 Charge time with the included Nomad solar panel: 40-80 hours. Lightweight and very portable, the included panels fold up nicely and are fully protected inside the canvas sleeve. Ports are color coded and organized, so the different sections of ports can be powered on and off separately to save power. I know what you are thinking: 300 continuous watts, that’s nothing. But actually it is suitable for running smaller hand held power tools and the perfect match for someone who will run fewer tools simultaneously. However, if you do need more power for a larger tool, you can chain this unit to another one. 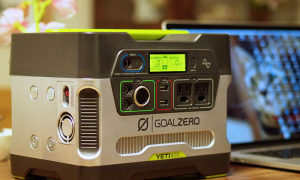 The Yeti 400 can also be charged by and AC outlet or a car adapter. An all in-one power station which features 1200Wh (100Ah) capacity. Continuous watts: 1200; Starting watts: 1500 surge pure-sine wave inverter. Versatile outputs are available (2.1A USB, 1200W AC and 12V) and it can power up to 10 devices at the same time. Capability to extend the runtime by chaining it to other 12V, 100Ah batteries. 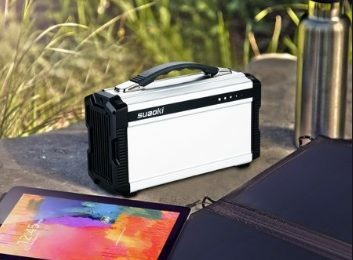 Three charging ways: With Boulder 200 briefcase – 12 – 24 hours; Wall charger – 18 hours; Car charger – 44 hours. This is what you would call a power beast. Goal Zero stands for high quality and the Yeti 1250 is the perfect option for powering any hand held or heavy duty power tool. When you turned it on, you won’t even know it’s there – it’s has an extremely quiet operation. Being that it is somewhat heavy, Goal Zero offered a solution by including a rolling cart to make the moving much easier. When it comes to size, it is smaller than the average mini fridge, with the dimensions of 16x15x12. Highly recommended unit of powering almost anything, especially your power tools. 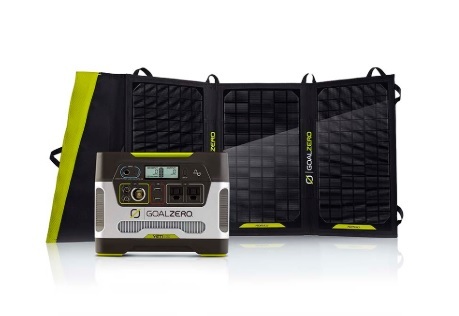 A powerful solar generator with a 1231-watt hour Lithium-ion battery. Continuous watts: 1000; Starting watts: 2000 surge pure-sine wave inverter. Made to power larger scale electronics, therefore suitable for power tools. Very portable and designed for easy carrying. It features one 12V output, one 19V DC output, two 5V USB ports and an integrated 110V AC standard outlet. So, it can charge multiple devices at the same time. Three ways of charging are available: solar panel, car adapter and AC outlet. With the weight of only 40 pounds, this solar generator is much lighter than any other with the same or similar capacity. It also features a silent operation and the only noise you will be hearing is from your power tool. It has a maximum capacity of 1231 which is almost as good as the Yeti 1250. 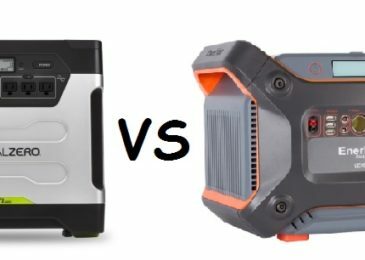 This solar generator is not popular among users but this is all due to the fact that Ascent has not yet reached popularity and that people do not know that the Ascent Solar generator Y1200 is actually the better replacement for the Yeti and a much lighter one. Also check out the difference between Yeti 1250 and Ascent Y1200. Before you make any purchase, think strongly about for what tools you will be using the solar generator. But the ones with more capacity are the solution for hand held tools as well as the bigger ones. The Yeti and the Ascent are the highly recommended and a safe choice for your power tools. With them, you are prepared for any off grid work.